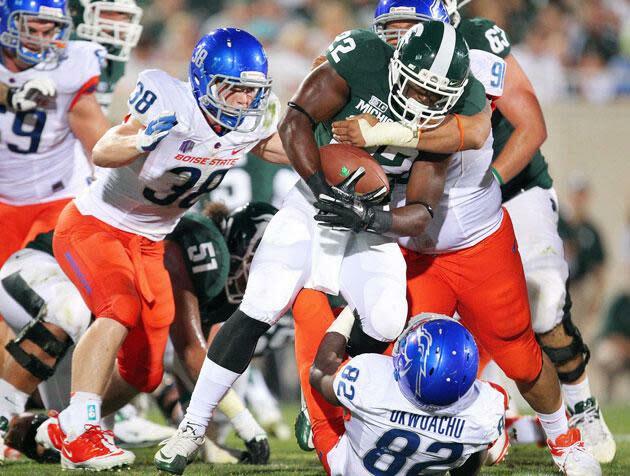 As rule changes focus more and more on player safety and concussion prevention, Boise State’s football team is attempting to get ahead of the curve with some tips from another hard-hitting sport. Broncos head coach Chris Petersen had the local Snake River Rugby Club come in to run a tackling session with his players. Snake River is coached by former U.S. national team captain Mike Saunders and features former members of the Boise football team on the roster. Rugby tackling is different from what you normally see in football, as the head almost always goes to the side of your opponent as you make impact. There’s also the major difference that one sport involves wearing helmets (which some believe make players feel overly protected to the point they use their own heads as weapons) while the other does not. Launching into a tackle is different, too, said, Kwiatkowski. Football players have to defend every inch, whereas in rugby, unless you’re defending your goal line, you can give up a foot or two to bring the man down. How players wrap, align their bodies, and launch is all different. In the NFL, players are no longer allowed to lower the crowns of their helmets to deliver a blow outside of the tackle box. In college, officials will be allowed to eject players who they judge as targeting a defenseless player above the shoulders. In the Pac-12, they’re limiting contact in practice. Petersen and Boise have been innovators during their rise to national prominence, getting creative with everything from the color of their field turf to the trick-laden pages of the playbook. All teams are looking to keep their players healthy and I wouldn’t be surprised to see other programs start following Petersen’s lead. As football coaching staffs from across the country look for every little edge, expect to see them work with their university’s rugby teams to gain any possible advantage in both safety and tackling effectiveness. Want to join the conversation? Hit us up on Twitter @YahooDrSaturday and be sure to "Like" Dr. Saturday on Facebook for football conversations and stuff you won't see on the blog.